The current rage of “stacked Milky Way” (or night sky) captures is quite different from the star trail or timestacks style of captures. Huh? The words stack and stacking are overloaded with many different meanings. Let’s see if we can add some precision and clarification. Auto Blend Layers with Stacking: Used for macro/focus stacking, HDR, and generic image blending – NOT for astro images! Lighten Mode Stacking: Creating Star Trails! Statistics Mode Blending (Stacking): Can perform the same operation as Lighten Mode Stacking when the option “Maximum” is used, however Statistics are heavy weight and more complicated to do in our opinion. Align and Stack: Deep sky astrophotography using several images taken one after another as quickly as possible. Photoshop doesn’t do this well, but we describe how in the next section. Align is the distinguishing word here. Tracked Stacked Images: For still astrophotography images with less noise and greater detail. A device is required that tracks the sky rotation – the word tracked is the key here. Group into Stack: Not stacking at all! It really just means “create a group”. The above is NOT an exhaustive list of the kinds of stacking you may hear about! Let’s start with the easy one: Stacking may mean add to group. 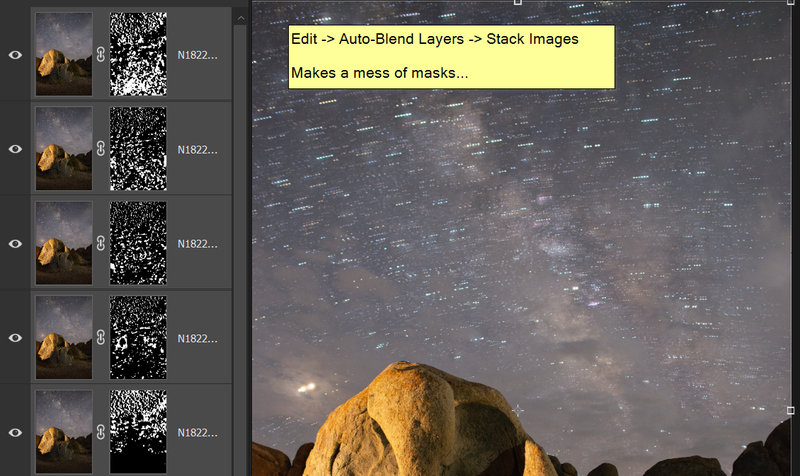 In Lightroom and Adobe Bridge you can pick several photos and the options Stacking -> Group into Stack. Or pick several photos and either Photo Merge to HDR or Panorama with the “Create Stack” option checked. In this context, Stacking and Stack just means group. Unfortunately a photo can only appear in one stack, and you cannot stack photos from different folders together. Why would you want a photo to appear in two (or more) stacks groups? Here is an example where I used a single top shot and created two different panoramas. Panoramas 1 and 2 were both created using image 3 (608095.NEF) but when panorama 2 was created, image 3 was removed from the stack (group) for 1 and added to the stack (group) with 2. Furthermore, you can see that the panorama and the two photos used to create it were all added into the group (notice the last image says 3 of 3). 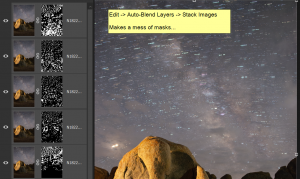 Stacking may mean blend photos in lighten or darken blend mode – examples are star trails and timestacks. In this usage, the lightest (or darkest) of all the pixels in each image is selected. This is the kind of stacking that AdvancedStacker Plus does. Below is an example of taking several images that we collected over time with long delays between each exposure causing the “dotted” appearance of the star trail. Stacking can ALSO mean ALIGN and blend images with median, mean (aka average) or more sophisticated algorithms. Indeed astroimagers have been doing this style of blending for years using techniques that involve “star registration” (aligning stars with stars) and some pretty fancy stacking algorithms like Alpha-Kappa Median Clipping and Entropy Weighted Average. The key point here is the alignment. 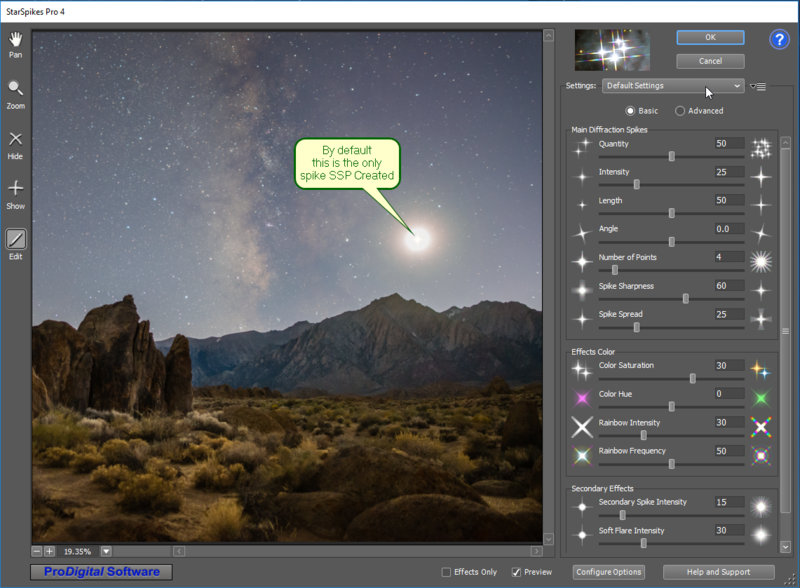 Indeed, here at StarCircleAcademy, we’ve explained how you can brighten and reduce noise in your foreground using simple astrophotography processing techniques. 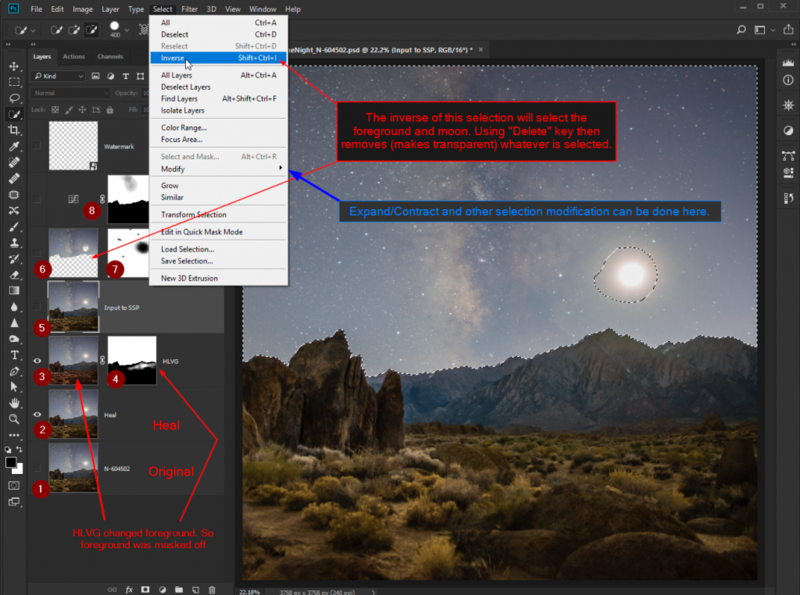 See below for how to accomplish Align and Blend Stacking in Photoshop, and plenty of warnings about why this method is very likely to FAIL using Photoshop as the tool. You may also see references to tracked, stacked images. These are the same as “align and blend” just described, except that to capture the image, the camera is guided by an external device (or by some fancy internal hardware), to allow longer exposures of the stars without getting unintentional trailing (smears) of stars. The takeaway is that not all stacking is created equal. You need to know the context to understand what is meant by the word: stacking. 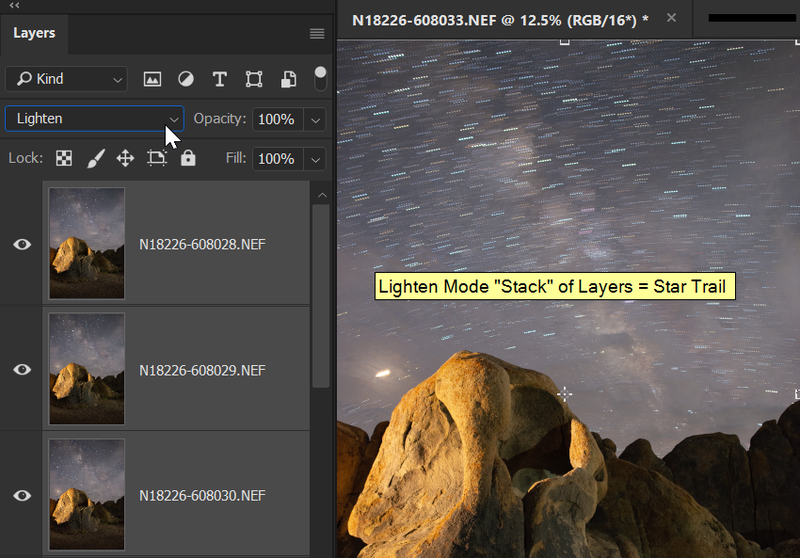 In Photoshop there is Edit -> Auto-Blend Layers -> Stack Images this is yet another kind of stacking (focus stacking) and despite the wording is NOT the kind of operation needed to ALIGN and Blend astro images. If you don’t believe us, give it a try and you’ll see it will do very weird things with your layers. Below are the same images as earlier. Note the bizarre masks it created to do the blending. Edit -> Auto-Blend Layers -> Stack Images makes a mess. We told you so! Click to see a bigger image. While it would probably be better to make this a separate article in itself, we found it painful enough that we don’t recommend bothering – and yet we proceed to explain HOW to do it anyway! The direction of sky movement relative to the ground has a significant influence on the quality of the result (as well as the order chosen for alignment). In general, setting constellations are better than rising ones. Most of the existing tutorials will assume that you have a recent (CC) version of Photoshop with statistics and an an “Auto Align” that properly manages masked regions. Some of the tutorials we’ve observed are more cumbersome than they need be. There are plenty of hotkeys and mouse shortcuts to make the process go pretty quickly. More than 10 or so images can become quite demanding on machine resources. The complexity of your foreground will also affect the outcome. A clean, crisp separation between sky and land is preferable. Trees, poles, wires, and other things that extend through the sky are problematic. Lens distortion can also adversely affect the outcome. Load all the photos as layers in Photoshop. Heal out airplane and satellite trails from each layer. Select all the layers in Foreground. Use Layer -> Smart Object -> Convert to Smart Object. Duplicate Mean using Ctl-Alt-Shift-E (Command-Option-Shift-E on MAC). Label the newly created layer “Mean” and turn it off. Select all layers in Sky. Set blend mode to “Lighten” and observe the direction of star movement against the ground. Be sure the image with stars nearest the ground is at the BOTTOM of the stack. The bottom layer will be your base for alignment. You can drag layers around, or Layer -> Arrange -> Reverse may do the trick. Create a mask keeping as much of the sky as is easy to do but that DOESN’T include any ground or fixed location objects. IMPORTANT: Be sure the mask doesn’t have holes in it, including at the bottom corners. Click the layer mask, hold down the Alt (Option) key and drag the mask to the next sky layer. Repeat until all sky images are masked with the same mask. Select all the sky layers. When alignment is done, set blend mode for all sky layers to Darken. If stars are disappearing in the result image, that’s bad. Duplicate the current layers to a NEW document – call it whatever you want, but perhaps “Left looks good” makes sense. Open the history palette and click just above the “Align Layers” item (to restore to before the alignment was done). Lock the TOP layer (see item 11) and repeat steps 12-14. If a large portion of the image still has streaks in some quadrant, try undoing align, undoing the lock and re-aligning. If you’re still getting a significant amount of streaking you can also try Auto Align -> Reposition rather than auto. Q: Why do I have disappearing stars? A: The reason they are disappearing is because they are not aligned. In Darken mode, the darker sky “wins” out over the several stars. This COULD be a good thing in other situations, but not here! Q: If I went through the trouble of doing all this alignment, why is it still “off”? A: Photoshop isn’t optimized to align stars. Secondly, lens distortion makes a star move non-uniformly across the sensor. And third: stars at different declinations (celestial latitudes) travel at different speeds across the field. To eliminate streaks, the best solution is to track the sky. Take the aligned sky, delete all the layer masks. With all the aligned sky layers selected, create a smart Object. Do the same Stack Mode “Mean” trick for the sky smart object that you previously did for the foreground. The rest is pretty straight forward. Turn the foreground (mean) back on. Use a selection to reveal only the foreground and apply that to the Foreground Group. Adjust contrast, color balance, vibrance, etc. to your satisfaction. Save the kit and caboodle. Does all this seem too complicated? Well, then perhaps you might consider using these tools instead. They do most of the hard work for you and they KNOW the difference between stars and foreground (usually because you help them know). On a PC: Sequator – do a Google Search to download it. By the way there are many astro processing tools, like Deep Sky Stacker – but most/all of them expect that your images will have NO foreground or non-moving objects like wires in them. This entry was posted in Aligned Stacks, Astrophotography, Creativity, Focus Stacking, Photo Processing, Photoshop, Stacking, Star Trails and tagged blending, Bridge, darken, deep sky, focus stack, lighten, Lightroom, noise, Photoshop, stacking, tips on August 21, 2018 by Steven Christenson. 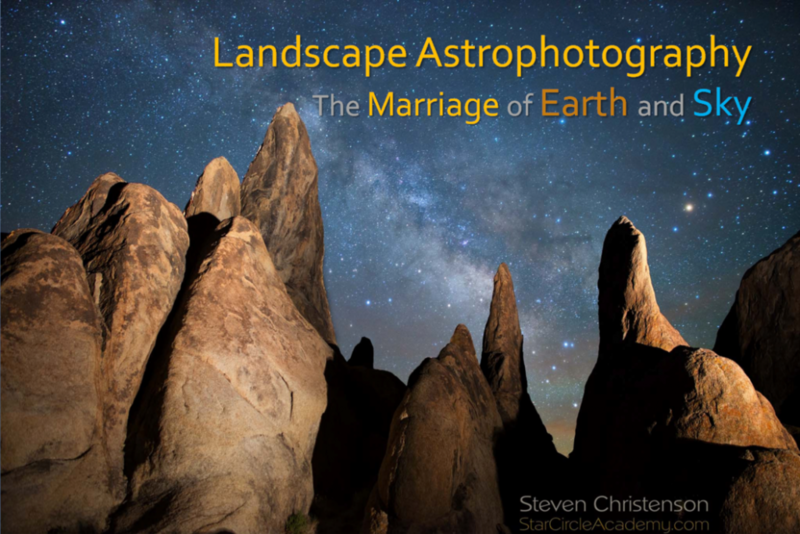 Thanks for attending my Landscape Astrophotography discourse with the San Jose Astronomical Association on Tuesday, June 19, 2018. 7:30 PM to 10:00 PM. Most of the audience are Astrophotographers. Below is a form you can fill out and we will email you a PDF of the notes from this lecture. Following are some brief excerpts from the talk. Big Sur, California, has earned a reputation for being The Greatest Meeting of Land & Sea, a phrase attributed to Robinson Jeffers, the “Walt Whitman” of the West Coast. Indeed living here is inspiring. The towering cliffs and mountains, lush forests, crashing, craggy Pacific surf all work together to evoke a sense of beauty and wonder that is astonishingly intimate. There are certainly other beautiful places in the world – even nearby. But I believe that there is awesome, virtually undiscovered beauty that touches nearly everywhere in the world: the night sky. 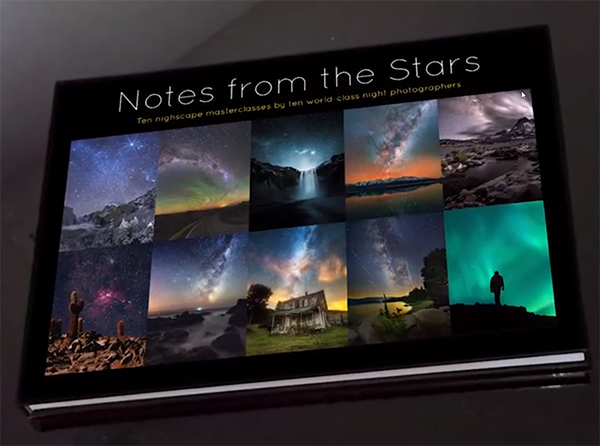 Night Sky photography has grown by leaps and bounds in the last decades. Prior to the age of digital photography, there were relatively few painters of the night sky. Not surprisingly, none of those painters painted just stars. All featured stars with landscapes. Perhaps the most well-known painter of the night is Vincent Van Gogh. In Van Gogh’s day, light pollution was far, far less noxious than it is now. Indeed our super abundance of artificial light has rendered our night sky almost unobservable. But the night sky has such depth and mystery that everyone should find a dark sky to sit under for a time. Part of the allure of the night sky is its expansiveness… its immense scale. Because the scale of the night sky is difficult to grasp I believe it is important to link human-scale to the starry night. Deep-sky photography of nebula and galaxies reveals things completely unseen or unseeable by the naked eye – and the revelation of those objects is compelling and engaging. But even more compelling are photographs that tie humanly identifiable scale to the mysterious night. In addition to scale, compelling photographs reveal the unexpected. Photographs can show time, location, relationships, colors, and details that are unobservable by looking. To draw lay people, however, I believe there must be a strong link between what is observable with what is not: a Marriage of Earth and Sky. 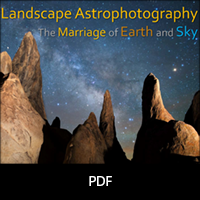 And for that reason, I’m urging Astrophotographers and astronomers to try Landscape Astrophotography. For more details, please see the accompanying notes. What Makes An Image Memorable? This entry was posted in Astrophotography, Creativity, Star Trails, Uncategorized and tagged connectedness, Landscape Astrophotography, light pollution, scale on June 19, 2018 by Steven Christenson. 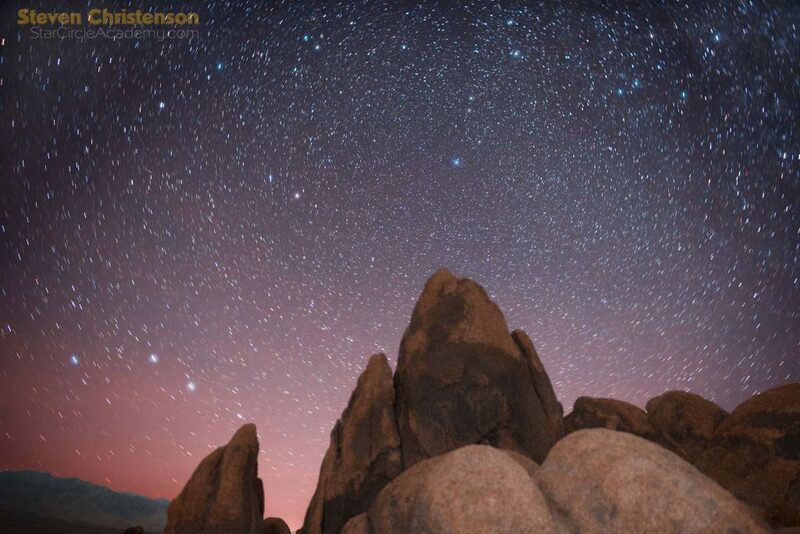 Because stars are pinpoints of light, the camera does not capture them as our eyes see them. To our eyes, brighter stars stand out more noticeably than dimmer ones. 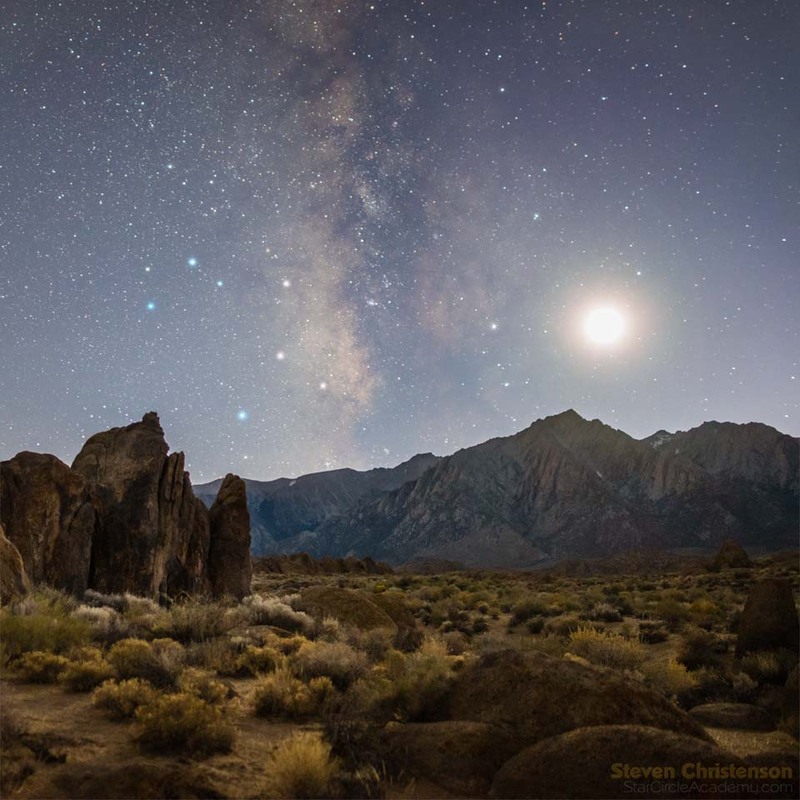 At a workshop in Alabama Hills, one of the participants, Julian Köpke, was using a diffusion filter so the stars captured would look more like you see with the naked eye. Sometimes nature provides its own diffusion filter in the form of high, thin cirrus clouds as shown below. The large bright orb is the star Sirius in the constellation Canus Major (Big Dog). 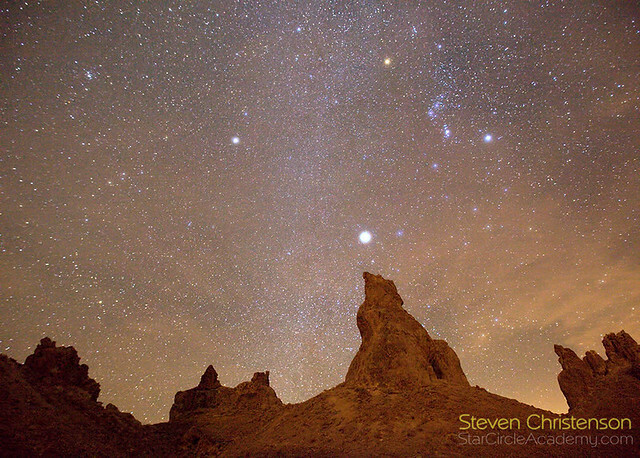 The orange star near the top of the frame is Betelgeuse in the constellation Orion. One nice thing about the blur that the clouds added is the star color is more noticeable. But the diffusion here is not uniform because the belt stars (Alnitak, Alnilam and Mintaka) and “corner” stars (Bellatrix, Rigel, Saiph) in Orion are all noticeably brighter than the surrounding stars while in this photo only Betelgeuse and Rigel stand out. The moon and Teapot Asterism in Sagittarius – over Lone Pine Peak – as shot. Same Photo as above, but with the Teapot Asterism in Sagittarius enhanced. Our Advanced Stacker Plus has two built-in ways to increase star brightness. We call those Bump Up and Pump Up the stars. Bump Up creates a small blur by literally duplicating the shot , nudging the duplicate(s) and recombining . Pump Up is more sophisticated and tries to find the stars so it can then apply enhancements to just the stars. 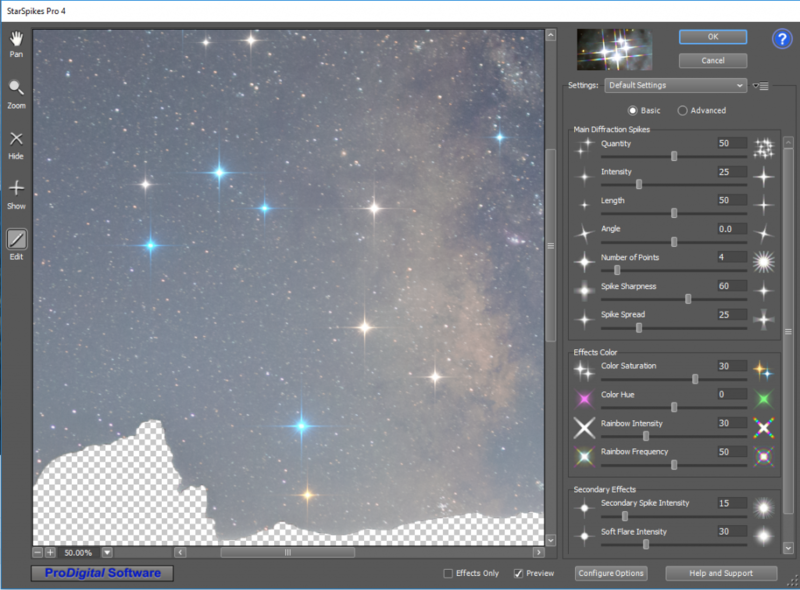 But there is a new tool in the arsenal that I have begun using: Star Spikes Pro from ProDigital Software. Version 4 is the latest as of this writing. NOTE: Star Spikes Pro and HLVG described later are currently only available on Windows machines. You can use the Star Spikes Pro plugin to add diffraction spikes and diffusion. The most common diffraction spikes you see with stars are due to obstructions in the telescope used to photograph them and many people come to think of the spikes as evidence of astrophotography. You can create diffraction spikes easily on your own.- just stop down your aperture; however stopping down to make stars create those spikes will not work well. The first time I tried to use Star Spikes Pro it did not quite work as I expected. Look hard. Star Spikes Pro decided the moon was a huge star outclassing all others. Indeed it took me a bit to realize what was going on. The good news is it was easy to work around. The huge moon looks like a huge star to Star Spikes Pro – and that makes perfect sense since the plugin is usually used with Astrophotography that does not involve landscapes. Here is how I made it work as I wanted and limited the effect to just the desired stars. Above left is the layer palette. Look carefully and you may spot the fix. After loading the image (1) I first duplicated the original and called the new layer Heal (2). I then did minor contrast adjustments, used the healing brush to remove hot pixels and other offenses (short satellite trail). Next I duplicated the Heal to another layer (3) and fed it into Hasta La Vista Green – a free plugin written by Rogelio Bernal Andreo of DeepSkyColors. HLVG removes green which is an unnatural sky color usually caused by RGB artifacts. HLVG operates on the entire layer and does not know the difference between land and sky. To leave the natural green in my landscape I used the quick selection tool, dragged it across the sky followed by Select -> Modify -> Expand 4 pixels. Then I created a Layer Mask using “Reveal Selection” (4). That made the foreground come back to its normal state. If you look carefully you will notice I also used a white brush to add some of that green removal back onto the mountain by painting on the HLVG layer mask (4). The next operation was a finger twisting sequence that has no menu equivalent: Ctrl-Alt-Shift-E (on Mac that’s Command-Option-Shift-E). What that sequence does is “flatten” all the visible layers and create a NEW layer in the process (5). That layer I called Input to SSP. Since I had discovered that Star Spikes Pro was confused by the moon (and could be confused by the foreground), I used the quick selection tool again and brushed it across the foreground. By default using the quick select tool again ADDs to the current selection so I brushed it around inside the moon and its halo. At this point I did not need to create another layer (Ctrl-J/Command-J or Duplicate Layer) but I did so that it was easy to see what happens next. After creating the new layer I selected it and used the delete key. Delete removes the selection making it transparent – that is the foreground and moon were now gone (6). I felt the color was a bit too strong, and I did not want the diffraction spikes. The next step was to select “Advanced” – just below Settings, set the Primary quantity to zero. Next was the Secondary tab where I reduced the quantity to 44, the intensity I bumped up to 23. Soft flare I set quantity to 12, bumped up the intensity, dialed down the size a little and dialed down the Hue to -21. These adjustments were all based on eyeballing the image and were made for aesthetic appeal. After all the adjustments looked about right, I saved the settings as a new adjustment I called “DiffusionOnly”. Finally I clicked OK and my layer was all nicely done by the SSP filter. The filter processed a few more stars than I intended to augment. The simple solution was to create a “Reveal All Layer Mask”, select a brush, the color black and paint out all the effects I did not want on the layer mask (7). The final operation was to use an Adjustment Layer (8) to increase the contrast and restrict that adjustment to the sky (where you see white) and tone the adjustment down a little with a low-flow back brush on one area that looked a little too dark. The topmost layer in the layer palette is my watermark. With some experimentation, and some coaching from the plugin author I discovered that Star Spikes Pro has several features that make the process easier than I imagined. Instead of creating the transparency (deleting the moon and landscape) I only needed to select the area I wanted Star Spikes Pro to operate on. Also, instead of masking off the stars I did not want affected after the fact, Star Spikes Pro has two tools to greatly simplify things the: “Hide” tool to turn off any effect that I did not want, and the “Show” tool to turn the effect on. 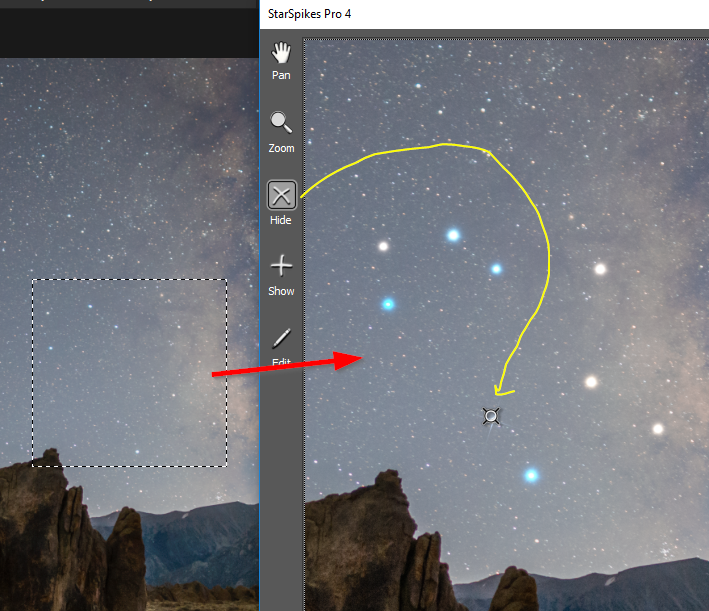 Star Spikes Pro limited to specific section of the sky via a selection and using the Hide tool to turn off an effect. The net is that you can get that nice diffusion effect for your stars without having to compromise by shooting through a diffusion filter. However if you DO want to try a diffusion filter, I recommend you take two shots quickly. One with the filter off, one with the filter on. You can then place the diffused shot over the normal shot. Set the diffused shot to Lighten and mask in (or out) the areas where you want the diffusion to show through. If you’re wondering whether there is a way to get the diffusion effect on a Mac or without purchasing Star Spikes Pro, there is, but it requires a lot of Photoshop twiddling and it is not anywhere near as pleasant as using ProDigital Software’s Star Spikes Pro. This entry was posted in Astrophotography, Creativity, Image, Photo Processing, Photo Tip, Photoshop, Selections and Masking, Tools and tagged bump up, diffraction, diffraction spikes, diffusion, Filter, layering, making stars stand out, masking, Photoshop, plugin, ProDigital software, pump up, quick select tool, selection, spikes, star spike pro, star spikes pro, Windows on November 6, 2017 by Steven Christenson. Last week we talked about photo processing. This week is the last week of the in-person course. The topics covered in class included Astrophotography, suggestions on what equipment NOT to get for Astrophotography. We also discussed the limitations of Lightroom and Photoshop (see Lesson 5) because we did not cover them all in the last class. To conclude our lesson series we present our greatest tips. Many of the tips you may be familiar with – especially if you have been with us on a workshop. Some tips will be a surprise. Shine a bright flashlight through your viewfinder at night and it will show you what is in your shot. Much easier to figure out where the edges of your frame are when it is too dark to see well. A flashlight will not illuminate the sky where your shot is constrained by your lens, but a bright green laser through the viewfinder can accomplish that! Put glow sticks or LED slap bracelets around your tripod at night. Not only can you find your gear easily, but others are less likely to trip over it. Have a bluish LED light that you need to make less “cold”? Bounce it off the palm of your hand… or a warm colored shirt. Want to see well in the dark? Don’t wear a head lamp! Shadows and contours are hard to see when the light is coming from close to your eyes. Instead keep a DIM light at waist level. Bright lights ruin your night vision. And headlamps make it painful to talk to one another… you ruin their night vision when you look at them. Before you spend the effort traveling for night photographs, consult the weather and the moon phase. It is astonishing how much you can pre-plan a shot without having to go the location… hint: learn to use Google Maps + Street View! Don’t overlook the hundreds of tips we have for you here on this site… the search box is your friend. Dark skies are good… but better is to know which direction you want the sky to be dark so you can make the right compromises. Sometimes being behind a hill is a great help to prevent unwanted stray light. 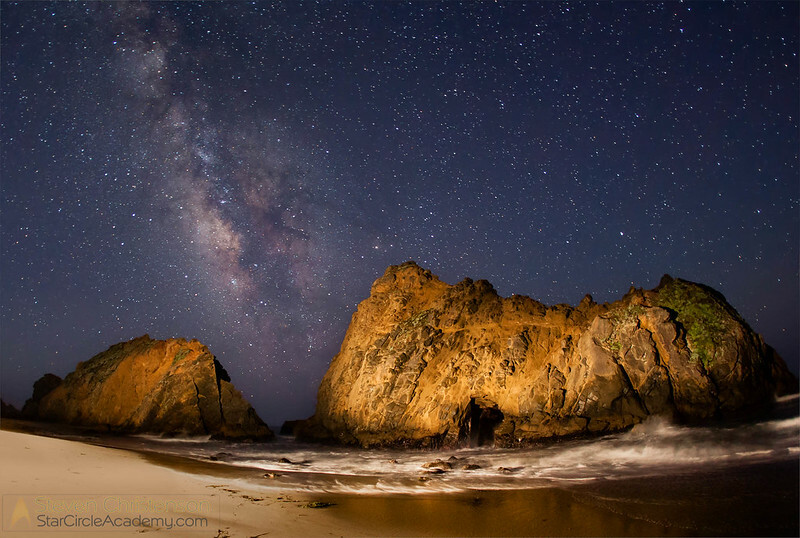 Want to photograph (or see) the best part of the Milky Way? You need to know when it is up. A planisphere (rotating star chart) is your best bet. Velcro is a great way to keep things handy and secure on your tripod. Velcro your intervalometer to your tripod. Lens hood – use one all the time to protect your lens and prevent stray light from causing glare. Do not use any filters – especially not a clear or “ultraviolet” filter. All filters make your image less desirable by causing extra surfaces that can reflect light and cause glare. Our only exception to this rule are 1: polarizing filters – which are useless at night, and 2: a filter to seal your lens in really nasty environments like rain and blowing sand. Test your tripod stability before you move away from it. If your tripod is secure, take a few steps back and make sure the center column is vertical. It is common to set a tripod up so that it leans in a way that makes it vulnerable to a fall. Another tripod tip: on a hill or slope, put two legs on the downhill side, one on the uphill side. Short straps (or no straps) on your camera is better for stability if there is any wind at all. We have personally seen cameras thrown over by wind gusts. Do not cheap out on a tripod. A sturdy tripod is more valuable for night photography than a “better” camera. The histogram is your friend. Be sure to check it before you conclude your shot is a good one. If your tripod has a hook below the center column hang your camera bag on it for even more stability. Be sure you’ve taken out all you need before you start shooting. Oh, and this may NOT work well if it is really windy or your pack is light. Study the place you plan to go during the daylight. It is not fun falling in holes or stepping on nasty things while wandering in the dark. A ball head works a lot better for night photography than a pan-tilt head. But get a sturdy head! It is useless having a sturdy tripod with a head that can not stay put. If there is anyone who may care: tell where you are going and when you expect to be back. Stick to the plan, too. Do not assume you will have cell service – some of the most amazing places to photograph have no cell coverage at all. Oh, and your battery might die. Overshoot. It is so much better to have two or three times as many shots as you think you will need than to find out you did not even get one quite right. When shooting sequences or panoramas… use your lens cap between sets so you can figure out when one set ends and another begins. Take it one step further and do what we do: use your hand forming an E, N, W, or pointing down to indicate the direction you are facing when you take the shot. Dark gloves make great “emergency stray-light reduction” devices – and they can keep your hands warm, too. It will always seem colder at night than the temperature might indicate. Dress in layers. 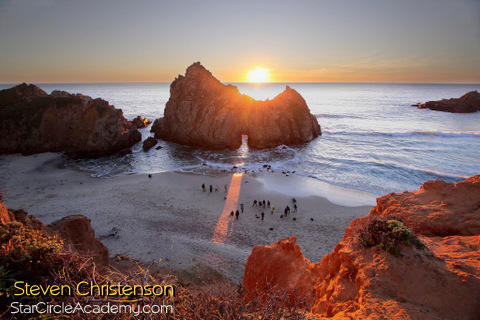 Planning to leave your camera shooting for a long sequence and walk away? Use a GPS to record the camera location (you can do this using most cell phone map software, too). Respect people and their property. Ask for permission. You may be amazed how much farther courtesy and thoughtfulness will get you than being an intentional trespasser. Have a tip you think is really super helpful? Please comment below! Photo edit a “better” foreground into a star trail image. Comment below with what you’d like to learn about next. Get creative and leave us a comment below with a link to your super image. Comment below with the best tip you have learned about doing night photography. Milky Way and Waterfall – we talked about how to get the Milky Way aligned where you want it. This entry was posted in Astrophotography, Class, Filter, Tools, Tripod and tagged equipment, panoramas, sequences, sturdy, tips, tripod on May 12, 2016 by Steven Christenson.